Bill Herndon and his neighbors are unhappy about a development being built in their backyards. Marvin Peavy, owner of Peavy Properties, has already rented some of the Mar-Mel-Go apartments, and about 70 of the projected 150 apartments have been completed. The other 80 units are scheduled to be added soon. The two-story apartment buildings rise uncomfortably close to the homes of Pinebrook Drive residents, such as Herndon. Windows of the complex look directly into their backyards and homes. Marvin Peavy, now why does that name ring a bell? Ah, yes, CEO and CFO of Lower Lowndes, Inc. the corporation that bought 62.53 acres on Quarterman Road and attempted to rezone it from E-A to R-21 back in 2007. One of the neighbors saw the sign out front and a bunch of us helped convince the County Commission to deny the rezoning. Robert Eddington also lives on Pinebrook Drive. He is a builder and said everyone has a right to develop their property. What he’s disturbed about, among other issues, is that the plans they were shown are not being followed. Eddington was told most of the trees would be spared to protect their privacy, but when he came home several days later, they were all gone except a few. Eddington and his neighbors successfully fought a similar development on nearby Water Oak Drive four years ago. They had no such opportunity this time, he said. No notices of any hearing were posted. Neither Herndon nor Fuhrer saw any notices posted announcing zoning or development hearings by the Lowndes County Board of Commissioners. Hm, given that the ULDC got changed a year or so back to require notification of rezoning mailed to adjoining property owners, in addition to a notice in the newspaper and a sign out front, if there was no sign and neighbors didn’t get notices, I wonder if there’s a legal problem with the rezoning. Eddington’s fence was damaged during Mar-Mel-Go construction. When contractors finally fixed it 17 months later, he said his wife asked about the gate that was supposed to be installed. The site manager told his wife that it wouldn’t be installed until the rest of the apartments were completed. Eddington said they were originally told these would be “luxury condos,” but are very different from the way they were described. The previous subdivision (not Peavy’s) that did get built on Quarterman Road (because its zoning was grandfathered in way back in the 1980s) involved a builder shoving building trash through my fence into my field. And streetlights that were installed by the developer but never turned on until the subdivision residents got the Commission to institute a special tax district to pay for them. Herndon and his neighbors pooled their money several years ago and spent $4,400 to pave Pinewood Drive, so they feel they have a stake in how the road is used. He approached the Lowndes County Commission about the residents’ concerns and was eventually connected with County Engineer Mike Fletcher. Fletcher said a $30,000 siren-controlled gate would be installed on Pinewood Drive for emergency vehicle access only, eliminating unwanted traffic through their neighborhood. The property owner is responsible for installing the gate, said Kevin Beals, Lowndes County development reviewer. Ah, finger pointing! Not the county government’s problem; it’s up to the property owner. Nevermind the county commission approved the development with certain plans and requirements. Lowndes County Manager Joe Pritchard said he thinks Pinebrook Drive residents “have some legitimate questions and we ought to be able to provide a reasonable answer.” Pritchard said he plans to meet with County Engineer Mike Fletcher and Zoning Administrator Carmella Braswell on Monday to discuss the development and see what remedies might be available. Yes, we’ve seen that process many times before. Note he doesn’t say they’ll provide any actual fixes to any of the problems, just “a reasonable answer”. We’ll see if these neighbors get any satisfaction this time. According to the County Commission calendar, there’s a work session coming up Monday 13 July at 8:30AM and a commission meeting coming up Tuesday 14 July at 5:30PM. The Tuesday public meetings always have an agenda item for Citizens Wishing to the Heard. The work sessions usually don’t, but if you go you can hear what the commissioners have to say about subjects that have come before them, and often you can talk to them directly before or after the meeting. This entry was posted in Development, Law, Lowndes County Commission, Georgia, Media, Politics and tagged Bill Herndon, builder, Carmella Braswell, Development, Georgia, Inc., Joe Pritchard, Lake Park, Lower Lowndes, Lowndes County, Mar-Mel-Go, Marvin Peavy, Mike Fletcher, Quarterman Road, Robert Eddington, ULDC on July 11, 2009 by John S. Quarterman. Quarterman Road is a local rural road through a rural neighborhood. Reclassifying it as collector and raising the speed limit would create a safety hazard. 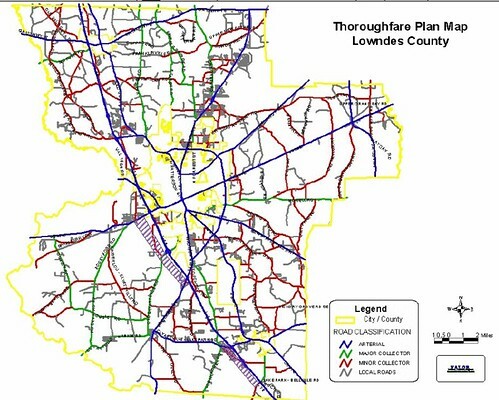 The first map below is from the Lowndes County Thoroughfare Plan dated January 28, 2003; this is the version currently on the county’s public web pages. It plainly shows Quarterman Road (near the top center) as a local road. This entry was posted in Canopy Road, Lowndes County Commission, Georgia, Politics, Safety and tagged agricultural, Canopy road, collector, Comprehensive Plan, GDOT, Georgia, Georgia Department of Transportation, local, Local Roads Rural, local rural road, Lowndes County, Quarterman Road, rural, Safety, speed bumps, speed limit, ULDC, woodland on November 24, 2008 by John S. Quarterman.